Gone are the days when CEOs gained popularity points by simply executing well-planned strategies – the consumers of today prefer to feel a ‘connection’ to the brand, and this usually manifests when their opinions on existing products and services are heard and acted upon. In a way, being a CEO is actually more tricky than it was before. But that’s not a bad thing either, given that constructive criticism can bolster game-changing improvements that would otherwise be overlooked if the team were to remain unreceptive to comments. But there are no more filling in feedback forms involved – social media is fast becoming a convenient means where brands can not only get feedback from their fans and critics, but also show a more ‘human’ side to themselves. From glimpses into their personal lives, to airing their views on issues brought up by their followers, here are 3 tech bosses who have mastered the art of social media. Probably one of the most active CEOs on social media, Razer’s ‘Chief Gamer’ Min-Liang Tan is one known to not only reply to messages and comments, but also does his own media monitoring, posting reviews of his products and his comments on them on his Facebook page. Through his efforts online, Tan has successfully created a persona that is both cheeky and honest, and fans have, in turn, become active followers and commenters on his social media posts. His frequent appeals to fans for their opinions has also made the community feel very much in touch with the ideation process, making the resulting products seem more like a team effort, and this subtle yet effective means of inspiring loyalty and excitement is something that other brands tend to overlook. In this way, Razer’s motto, “For Gamers. By Gamers.” has been given an added layer of meaning – products are created for gamers (the community) by gamers (both the Razer team and the community themselves). And it’s not simply replying to public comments on social media, Tan recently posted a screenshot of one of the messages a fan sent him, at the same time revealing that he reads “every message [he gets]” on his Facebook page. And from comments on the post, it seems like he’s not joking around with that statement. Tesla founder and real life Iron Man Elon Musk is one that doesn’t shy away from using his Twitter account to reply to fans and announce his plans. 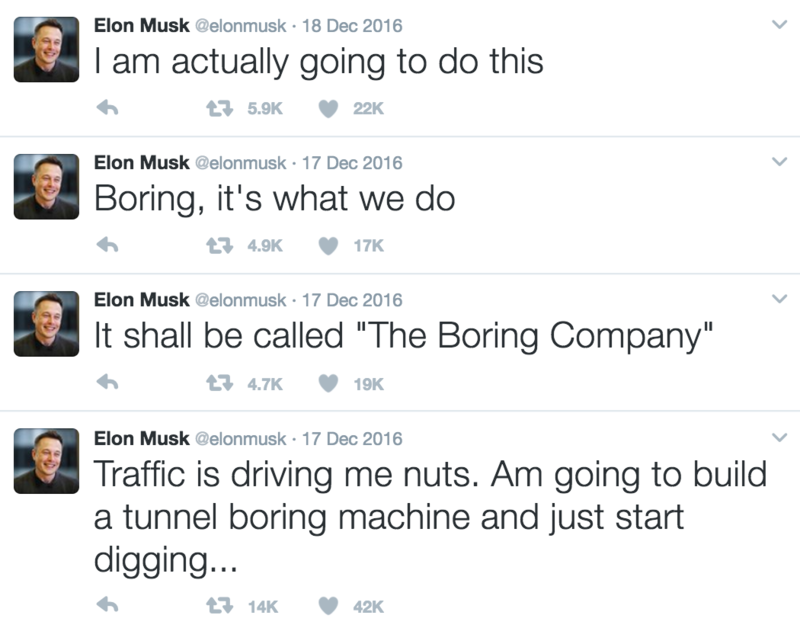 Moving away from the traditional, but cold way of issuing press releases, Musk announced at the end of 2016, in 140-characters (or so), his plans to go into the boring business. As in, the boring of tunnels – which quite honestly does sound kind of boring next to his other exciting ventures. But we all know that Twitter is mostly for ranting, and his sudden burst of tweets reminded us of the times when we make wild resolutions that we eventually fail to keep. As we all know though, social media can be a double-edged sword, and Musk recently got himself into the bad books of quite a few with his appeal to Twitter-zens about suggestions he could give to current POTUS Donald Trump on how to improve the highly controversial Muslim immigration ban. In another reply, he emphasised that while he felt that “the order is still bad”, he appealed to followers to read the source material, as compared to “other people’s opinions about [it]”. As of now, Musk’s latest tweet regarding the order seems to suggest that he is still on the defensive, and his association to Trump has reportedly led to a few people […] canceling their orders for the upcoming Tesla Model 3, but I’m sure there will still be many – critics and fans – watching his feed for more updates. A pretty obvious one, Facebook founder Mark Zuckerberg uses his Facebook account to share his opinions on current affairs, rile up excitement among users on what the Facebook team’s working to push out, and also peeks into his personal life as a husband and father. Earlier this year, he also shared, in depth, about his personal pet project – creating a Jarvis-like AI to run his home and help him in his work. Leaving no stone unturned, he elaborated, in detail, on both the process and the hurdles that he had to overcome during the year-long project. Releasing three tongue-in-cheek videos highlighting some of its features, it was admittedly rather awkward to watch due to stiff acting and dad jokes, but hey, no one (other than Morgan Freeman, who voiced the AI) are professional actors here anyway. Recently, Zuckerberg also shared his Lunar New Year experience, showing a side to him many would otherwise not imagine. Alongside that light-hearted post, he, like many other leaders in tech, also voiced his thoughts on the Muslim immigration ban, and while the post wasn’t strongly worded in its criticism of the order as compared to others’, it was clear that Zuckerberg was standing firm in his stance that it wasn’t the best way forward. The post has over 102k shares to date, and given his position, there have been naysayers criticising him in the comments, but there are also many applauding him for sharing his personal story and stance on the matter. 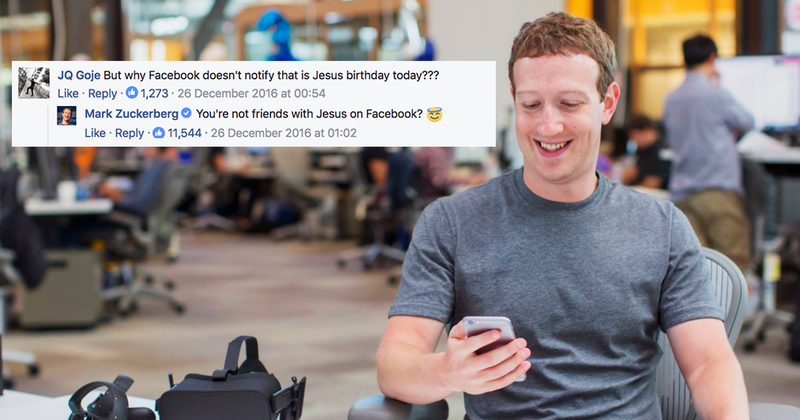 From how things are going, there’s no stopping the Facebook/Zuckerberg train, and we can definitely look forward to even more of his updates (both serious and casual) in many years to come. Social media has brought about the dawn of influencers, and while those mentioned are influencers in their own right, their personalities (or personas) can be positively boosted by using the platforms that both fans and potential fans use on a daily basis. On the other side, from what is seen from the #DeleteUber and Musk debacle on the ban, it also looks like consumers are more likely to support a brand if its values align to their own, and given that CEOs are the face of a company, it remains as a vital, albeit shaky ground for gaining (and losing) fans.